Seventeen year old Rhea Farrell carries the scars of a childhood accident in which she lost her arm. But she also carries scars that aren't so visible, the loss of a mother she hardly remembers, the impact of her father's drinking, and her confusion and pain around accepting her sexuality. When Rhea runs away, she turns to the person she always wished she could confide in, her mother. And just like she used to do as a little girl, Rhea starts to write her letters, to tell her things she can't tell anyone else, to share her fears, to ask for help. Rhea's journey on the streets of New York brings her deeper into her mother's past, where she uncovers buried family secrets. And as she finds out more about the woman her mother truly was, Rhea also discovers just what kind of woman she wants to be. Rhea lives her life on the streets of New York, relying on her only friend in Sergei selling his body for enough to help the unlikely pair survive another night. Rhea once lived a quiet life back in Ireland after her mother drowned and left her in the care of her father until a tragic accident claimed his life. With her only known living relative in Aunt Ruth having swept the now seventeen year old away to the United States, Rhea dreams of the bright lights of New York and following in her mother's footsteps. But being part of a family again isn't what Rhea expected or wants. At odds with her aunts partner and daughter, Rhea has no other choice but to leave the toxic environment and forge her own path into the world. In a series of letters to her deceased mother while living on the streets, Rhea begins to connect with the woman she barely remembers, waiting for a freedom her mother so desperately tried to find. How Many Letters Are In Goodbye was an emotional and poignant read, so why did I feel so disconnected? Rhea was a formidable character, her past experiences have left her with a genuine likability but it felt as though the length of the storyline allowed her story to lose impact. It begins with Rhea in New York, having fled her aunts new house in Florida where the two moved in with her aunts boyfriend and his teenage daughter, the popular and sullen Laurie. Herein lies my issue. I don't often speak of characters with such disdain but Laurie's character made me livid or perhaps it's how she was portrayed. Although Rhea is gay, Laurie is unsure of her sexuality and wants to explore. I still believe Laurie could have been used as a tool for teens to relate to that feeling of finding your sexual identity, but it felt as though it was sinister and manipulative sadly. Had the concept been explored in positive light rather than just a secretive fling, my attitude towards How Many Letters In Goodbye may have been significantly different. Yvonne Cassidy should be applauded for broaching what are generally confronting points of discussion. Abuse, neglect, abandonment, homelessness and prostitution. The loss of Rhea's arm at a young age felt as though it had very little impact. She was able, but was discriminated against by others especially when seeking employment. Her friendship with Sergei felt like little more than convenience, another body on the street who could provide her with a sense of safety and normalcy from what seemed to be out of obligation. The storyline begins in the year 1999 and takes place over a few months. I'm assuming that may have been the period of Yvonne Cassidy's teen years as there doesn't seem to be any other explanation as to why, only that perhaps she felt it was more authentic. I did enjoy Rhea's recovery and that to heal she understood the need for professional help when dealing with her loss and the secrets she uncovers surrounding her mothers death, rather than the quick fix solutions so many young adult titles generally offer the reader. The most appealing aspect of How Many Letters Are In Goodbye is that is was messy. The moments of reflection and solitude, then and engaging and almost frantic page turner that unveils Rhea's story slowly. But it was too long and the brutal nature of the storyline lost impact with me. Rhea's life on the streets seemed to rehash the same descriptive nature of being homeless, bloating the storyline and lacking that emotional connection sadly. It held promise, but unfortunately the length and lack of connection with it's characters made for a long and often rambling read. The only person who believes him is Charlotte Rooker, little sister to three cops and, with her soft hands and sweet curves, straight up dangerous to Thomas. Her friend was the other murder victim. And she’d like a couple answers. Answers that could get them both killed, and reveal a truth Thomas would die to keep hidden. It's just Thomas and his stepfather Stan now, after his mother's brutal murder in which Thomas is the prime suspect. Having moved to a new town and leaving his friends behind, eighteen year old Thomas should have been settling into his new home with his new family, but instead the entire town of Garretts Mill see the outsider as guilty until proven innocent after finding his mother slain in her bed. Thomas only wants to grieve for his mother but Charlotte approaches the sullen teen at his mother's funeral, their attraction is undeniable and they're not the only ones who have noticed. Charlotte is the only daughter of a local police officer, with three older brothers also following in their fathers footsteps. They already believe that Thomas is guilty of killing his mother but without enough evidence, they are willing to settle for harassment and making Thomas' meager existence a nightmare. Even with the threat of prison, Thomas can't seem to stay away from the youngest Rooker sibling... And it seems that Charlotte may be the only person to believe his innocence. Through a series of rendezvous and secret meetings, together Thomas and Charlotte need to clear his name but when Charlotte is attacked, all signs point to Thomas and the Rooker Boys will stop at nothing to see him behind bars. Thicker Than Water wasn't at all what I had expected. Intense, sultry and enjoyable for the most part. From the first few pages I gathered it was little more than a typical young adult contemporary but of course well written and engaging. Sweet, small town girl falls for the new bad boy in town, he's the town pariah and she wants to rescue his soul. They fall in love, he changes his ways and they live happily ever after. Thicker Than Water isn't that book. It's a complex contemporary blended with a paranormal romance that felt darker than another teen read, Although certain aspects left me a little underwhelmed, I enjoyed it. Thomas isn't a bad boy but he's the only suspect in a murder investigation after his mother is found slain in her bed. Having been married to the quiet and awkward Stan only a week prior, Thomas and his new stepfather are both at odds without the woman who was both their common link. While Stan isn't sure how to relate to a teenage boy, he's patient and kind which is more than Thomas and his attitude deserve at the moment. The relationship between Thomas and Charlotte was incredibly intense and both clearly attracted to the other but not willing to act on those feelings. Due to her overbearing family, Thomas felt that Charlotte couldn't be trusted and luring him into a confession on behalf of her brothers while Charlotte continued to second guess Thomas and whether or not he killed his own mother. Although I did enjoy the romance somewhat, their connection didn't feel genuine beyond their physical attraction. I found Charlotte's character unremarkable and bland, her feelings towards Thomas felt more as though he was little more than a stage of her teen rebellion. She was determined to seek out Thomas at every opportunity, knowing her older siblings had threatened Thomas, Charlotte is still willing to endanger his life. The paranormal twist did explain the reasoning behind why Charlotte was drawn to Thomas, it was introduced far too late within the storyline to try to reconnect to the characters. The paranormal element was surprising and felt almost like a quick fix to wrap up the storyline sadly. It flowed wonderfully as a contemporary and despite not being able to connect to the characters, the reveal left me feeling annoyed and frustrated. Although enjoyable, Thicker Than Water felt as though something was missing. It lacked an emotional connection and the paranormal elements were awkward and felt more like an afterthought than part of the storyline. Readers desperately need a sequel to understand the paranormal aspect of Thomas' life and not a bizarre solution to wrap up the storyline. It was wonderfully written but would have preferred a contemporary, rather than the strange paranormal it ended up being. Kelly is back with a brand new invention. She's not really, she just enjoys quoting Vanilla Ice lyrics. Word. Thanks for sharing! I'm sorry How Many Letters in Goodbye? didn't really impact you the way the summary made it seem it would. The author tackles a lot of topics but none seem to really stand out, according to your review, and that's always a let down. It just felt a little too lengthy Lauren and lost impact for me as the storyline progressed, which is a real shame. I wanted to love it but still enjoyed it overall. I feel like the author missed out on a better character exposition with Laurie. Which is sad, because if you're bent on writing a book about sexuality, one must not waste the opportunity. Brilliant reviews, as usual, Kelly! It was a secretive fling basically in which lead to Rhea being manipulated basically left to fend for herself. I just wish her exploration had been portrayed in a more positive light, especially since Rhea is also a minor and didn't have the support of her guardian either. I think I would find Laurie's portrayal as manipulative with regards to her sexuality very angering as well. The media already does a terrible job at portraying characters unsure of their sexuality anyways, books don't need to add to that. Still, kudos to the author for tackling all those topics! I'm with you 100% on Thicker Than Water. I liked Thomas' character quite a bit but that reveal felt like it was slapped on and I just wasn't a fan of it one bit. I was sad because it was going well for me before the paranormal parts appeared. Oh well. I loved Thicker Than Water up to that point too Nick. The contemporary aspect was so well written and for me adding that paranormal twist ruined the read. I didn't like Charlotte but loves Thomas' character too. Hmm, that's too bad about the first book. Sounds like it ad an opportunity to be so much more. And I felt similar about TtW. It's seems a lot of us share the same opinion with Thicker Than Water sadly. I wish it had remained a contemporary to be honest, it was much more emotional and a stronger read. I'll be interested to see if the follow up book is ore paranormal than contemporary though. Thanks Zoe. I think with How Many Letters Are In Goodbye, it's a case of it being me rather than the book itself. I just couldn't invest in it emotionally. Thicker Than Water reminds me of The Walls Around Us, where the paranormal element was just added to fix the problem (or at least it did for me). Awesome reviews Kelly! I'm sorry both books didn't live up to your expectations. I do find it funny that there are two January releases both with the title Thicker Than Water. I don't know if you noticed that or not! I actually hadn't noticed that poppet, but will have to go looking for the other release now too. I was really enjoying it up until the paranormal storyline kicked it. It felt awkward and was introduced far too late to make sense sadly. It's frustrating isn't it Sarah. I just expected so much more emotion and that it had the promise of breaking me. Although it was sad, unfortunately it didn't even come close. Thanks Nirvana. It was good, but just a bit too unnecessarily long sadly. I loved the premise, the intimacy of writing letters to her deceased mother as a coping mechanism. I'd love to see what you think of this one. Oh thanks for both of these. I'd been pondering Thicker Than Water but have heard a few mixed things so wasn't sure! Most of the reviews I've seen so far have really enjoyed it, but were thrown by the paranormal element too sadly. It was so well written apart from that ending so hopefully you have more luck than I did with it. Thanks Keionda. I did enjoy both despite the issues I found with each of them though. 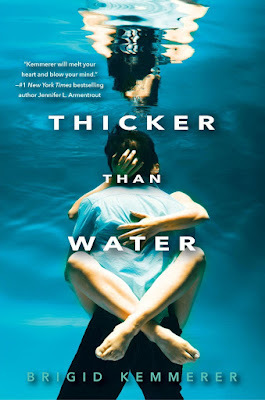 I was loving Thicker Than Water up until the twist, which I'm sure a lot of reader will really enjoy. Sadly I didn't though. These two both sound interesting but I don't know, neither sounds really amazing. I'm kind of desperate to find more amazing reads, 5/5 ones at that. I don't know, maybe I will try these at some point but I wouldn't be rushing to get to them. Hmm. These were both books that I was kiiiiind of interested in, but not too sure. Now I think I can firmly but them both behind me, which is probably a good thing (the TBR is out of hand as it is haha). 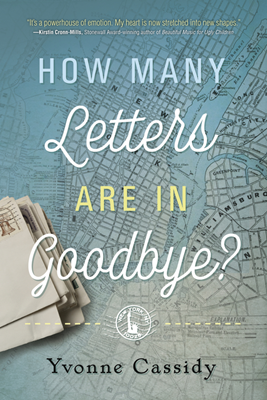 I don't love that there isn't a huge connection to the characters in How Many Letters in Goodbye, because that kind of seems like the point of a book like that. And I had NO idea that there was a paranormal piece in Thicker than Water. I don't necessarily dislike paranormal, but I DO hate when it is a random afterthought. Plus, Charlotte sounds incredibly boring. Also, the mom just married Stan a week ago, and he is taking care of her adult son? I AM kind of curious as to how that came to be hahah. Fabulous reviews!! This cover to How Many Letters Are In Goodbye? is so misleading. It doesn’t speak “life on the streets, emotional and messy”, it has quiet romantic vibe to it. Sorry to hear it wasn’t a total winner for you and you couldn’t fully connect with it. As for the Thicker Than Water, I’m still on the fence. I love contemporary and I don’t like “almost contemporary with a touch of paranormal”, especially when paranormal aspect is thrown late in the story and feels like an easy way to wrap up the storyline. Wonderful reviews, Kelly. Yeah, I haven't been too keen on Thicker Than Water, even when early reviews were raving about it. That lack of emotional connection definitely sounds like it could be a problem, and the paranormal elements jarring. Just reading your review on the first book makes my blood boil too, especially the exploitation of the character. It sounds like that has heaps of dark themes! Lovely reviews Kelly.